Photograph believed to be of Lloyd Albert Otto. * NOTE: Surname derived from birth certificate. Sometime in the late ‘70s or early ‘80s I stopped by to visit my paternal grandmother, Erma, and she took me down into her basement saying that she had something that she wanted to give to me. I must have been around 21, because I didn’t have a car or my license to drive until then because I either walked everywhere that I wanted to go or hopped on a city bus during inclement weather. 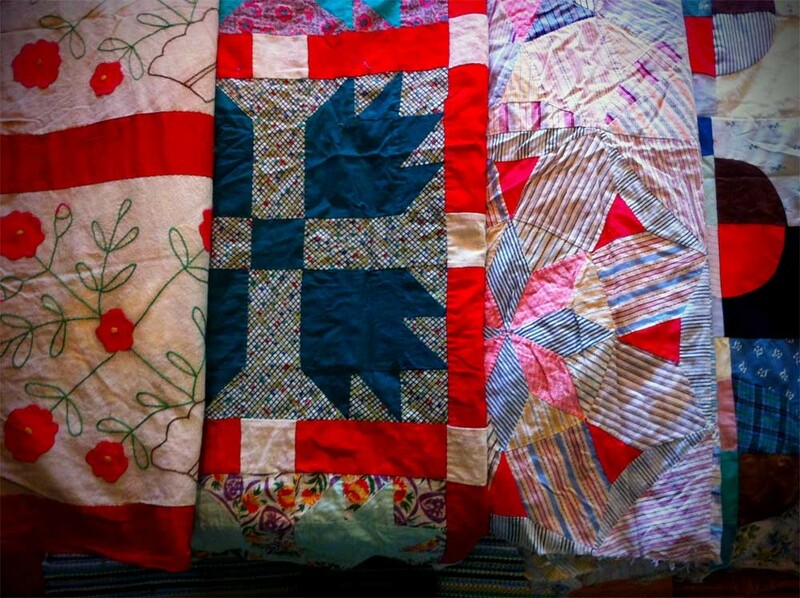 I was surprised and touched when she pulled out some old quilt tops that she had made and asked me if I wanted them because I was the only granddaughter that she knew of that sewed. And I did love to sew. I spent time when I was young with the Mary-Martha Fellowship at the Mennonite Church that I went to and with my favorite Sunday School teacher, Martha King, learning stitches and embroidering. My maternal grandmother taught me to basic knitting and crocheting and I remember knitting lots of headbands with variegated yarn. 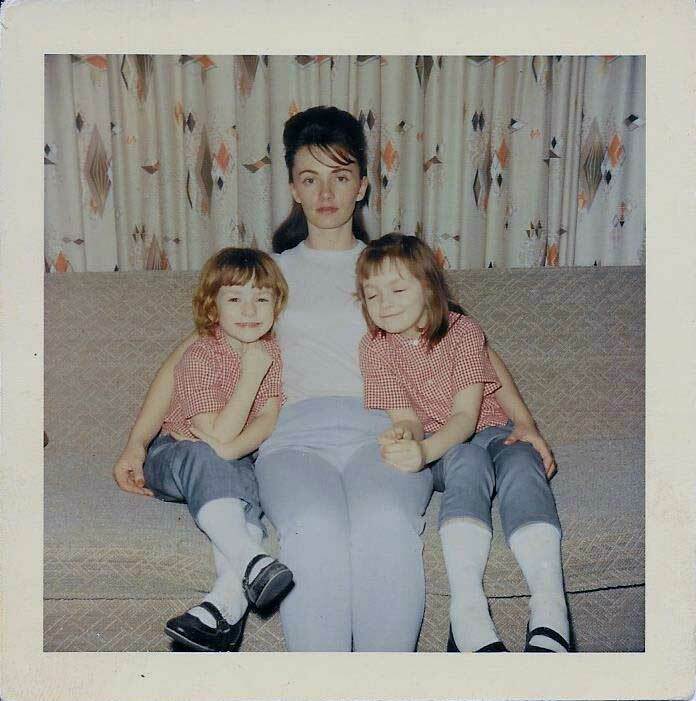 Because I was a kid in the late ‘60s and early ‘70s it was a time when fashions were changing and kids were splitting open the seams of blue jeans and inserting calico material to make bellbottoms. I did this, too, and also did a lot of embroidery on my jeans. At that time, embroidery was my favorite thing to do (besides reading) and I used to take whatever I was working on to church with me and work on it while sitting in the pew during services. And…I majored in Home Economics in high school along with music, art, and English – all those things that absolutely would not help me to get a job later in life. But I certainly can entertain myself! I believe that my grandmother told me that she had made those quilt tops during The Depression but had never gotten around to actually finishing them up. 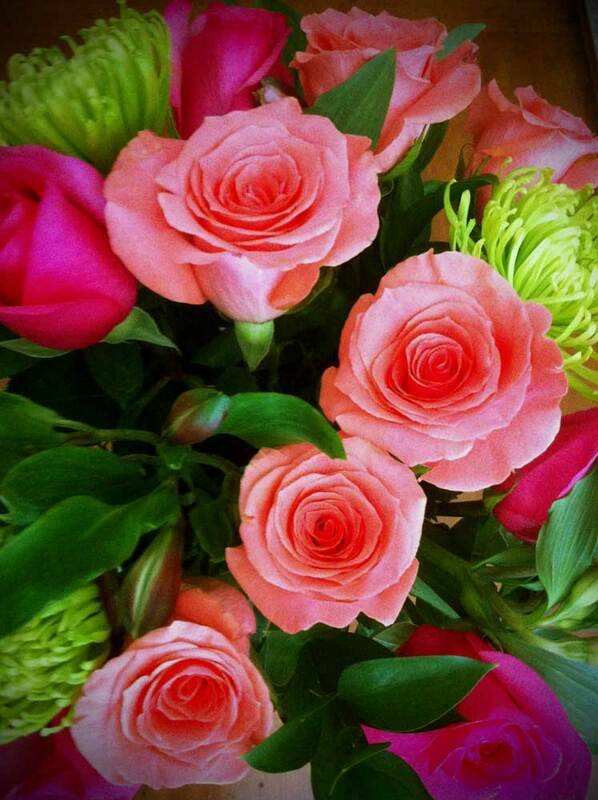 So she wanted me to have them because she didn’t think that she ever would. So I stored them away in tissue paper to keep them safe and have hauled them around with me wherever I have lived. In the small town where I raised my children, there was a house over on the next block that, for whatever reason, was selling off the contents of the house in yard sales for several weeks. Because it was a small town, we could walk most everywhere that we wanted to go and walked by this house often. One day my daughter and I were walking by and noticed that there was one lone item standing in the front yard that had a sign on it that said “FREE” and then I noticed that it was an old, handmade quilting frame. Yes! Perfect! My daughter and I picked it up and carried it down the alley. A couple of years ago, I got the quilt tops out and made some minor repairs where the thread had come loose from dry rot and then packed them away again. Soon, though, as soon as time permits, I will start to work on them since I have the space to spread out and get busy. I cherish these quilt tops as being a part of the family that has been entrusted to me and I’ll give one to each of my children as I finish them up. 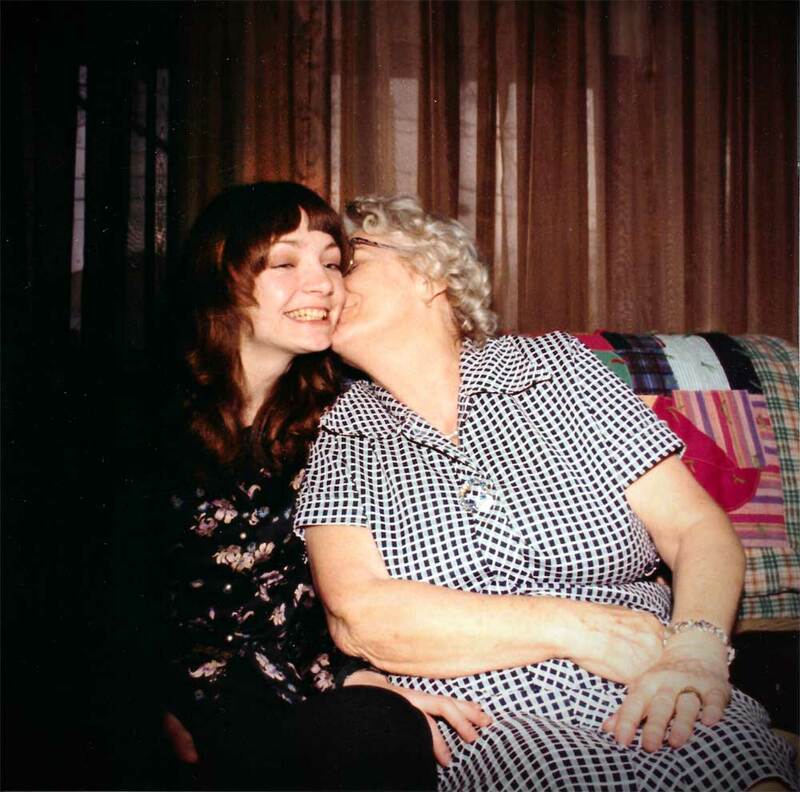 Me and Grandma Schrader circa 1982. One of the reasons why I adore these quilt tops is because they showed me a different side of my dad’s mother. I never suspected that she sewed. It seemed at the time like a small bond between us. My two grandmothers lived for a time right across the alley from each other, which is, of course, how my parents met. 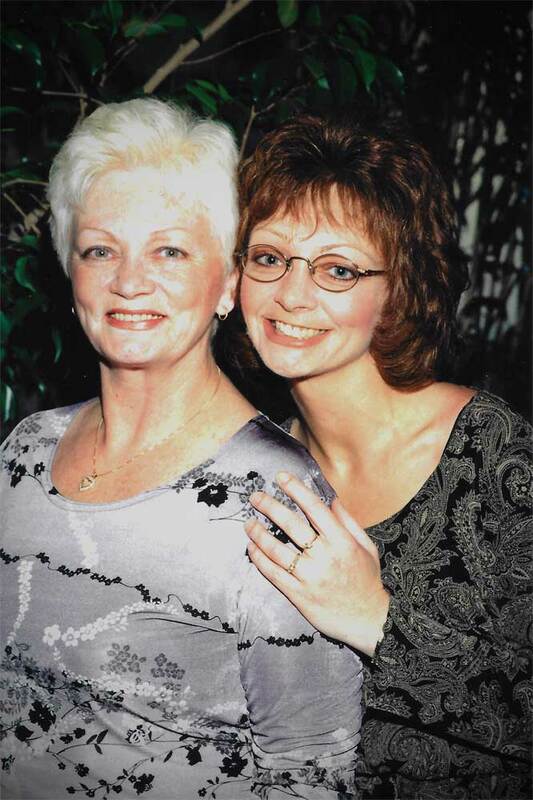 When I was in 2nd grade, my maternal grandmother went to live with her cousin and we moved into Grandma’s house, so for a while, we lived right behind my dad’s mom and my dad’s sister lived a couple of houses away. Two of my cousins and an aunt lived with Grandma, two more cousins lived nearby, and we were mostly pretty close to the same age. My grandmother’s house had a parlor-ish front room with covers on the furniture that we, as kids, were not allowed to enter. 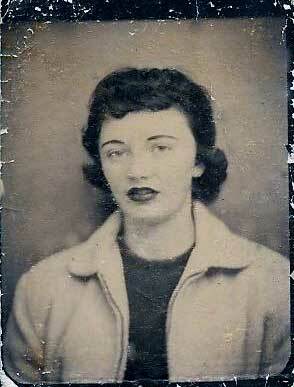 What I remember the most about my grandmother at this time was that she had housework duties scheduled. Although I don’t really recall what that schedule was, I’m pretty sure that she did laundry on Monday (sometimes we got to help sprinkle the clothes, roll them up, put them in a plastic bag and into the refrigerator), because Tuesday was ironing day. I’ve not been able to find much of a paper trail for this grandmother, but there are some things that I do know through various documents. 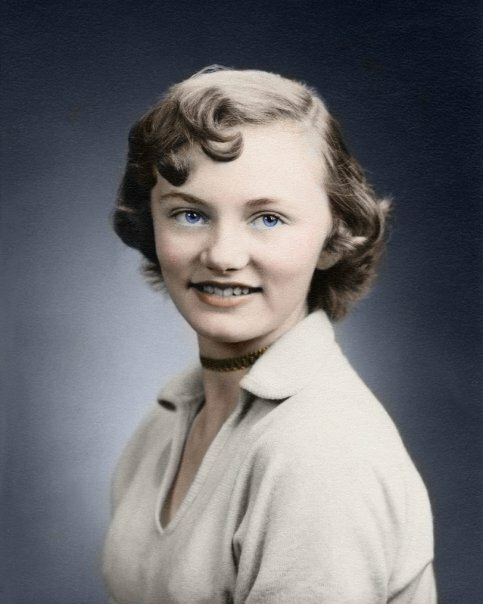 Erma R. Minnie Pittman was born 06 August 1907 in Flushing, Belmont County, Ohio to Jeremiah Mason Pittman and Sarah “Lena” Pool. She was the seventh of eight daughters and also had two younger brothers. So far, I have not found any actual birth document for her, but I have with her siblings. 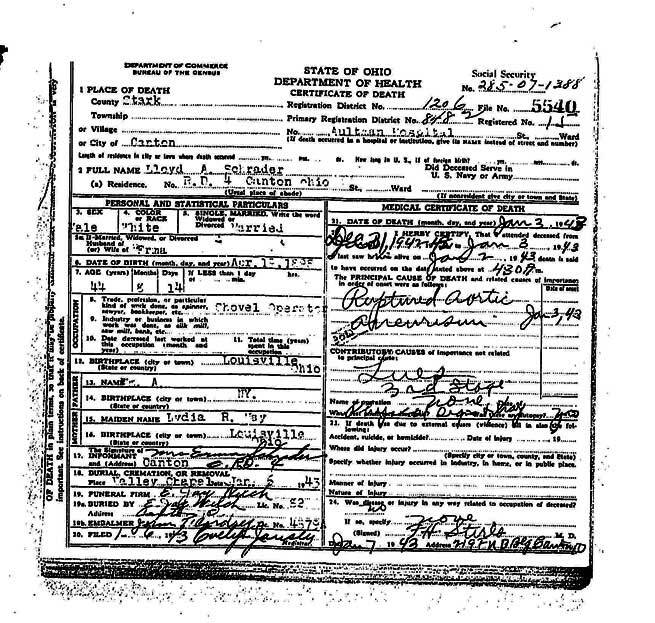 In the 1930 census, we find Erma living with her husband Lloyd Albert Schrader in North Industry in Canton Township, Stark County, Ohio along with his two young sons from a former marriage, Junior and Wayne, and their infant son. In 1940, the family is living in Plain Township, Stark County with their growing family, which now includes my father, George. Lloyd and Erma would have nine children, one of whom died as an infant. The youngest, Melvin, passed away a couple of years ago, otherwise, all of my paternal aunts and uncles are living today (with the exception of my dad’s two half brothers from Lloyd’s first marriage who have also passed away). In January of 1943, Lloyd would die leaving Erma with a house full of young children. Erma passed away 25 May 1994 and is buried at Sunset Hills Burial Park, the same cemetery as my maternal grandmother, Elsie, in essence, making them neighbors one final time. 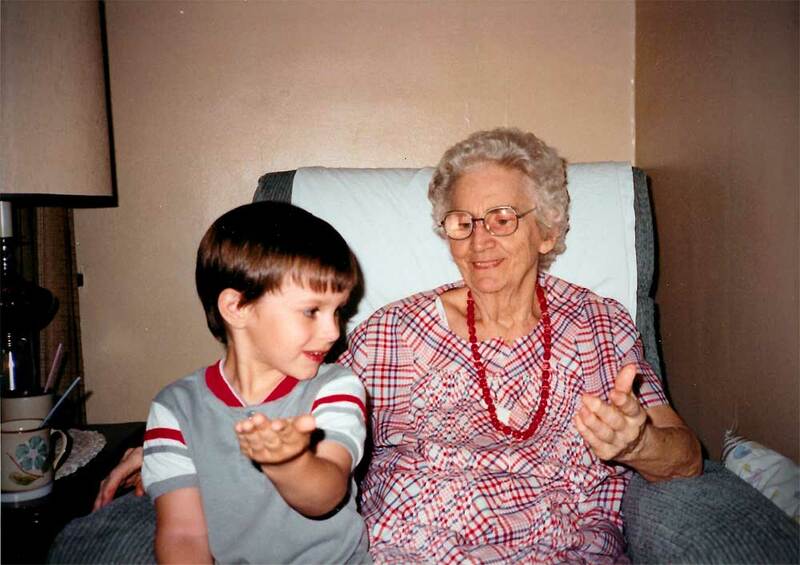 Grandma and my son, Timothy, circa 1990. The optional theme for week 24 was “Heirloom”. 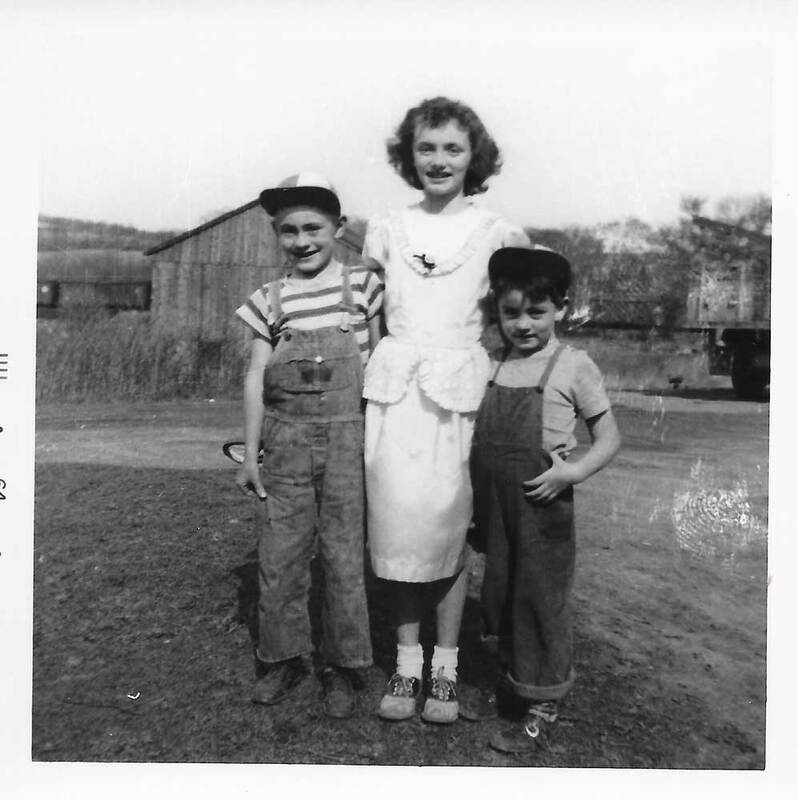 Mom with her two younger brothers, Danny-L, and Rich-R. 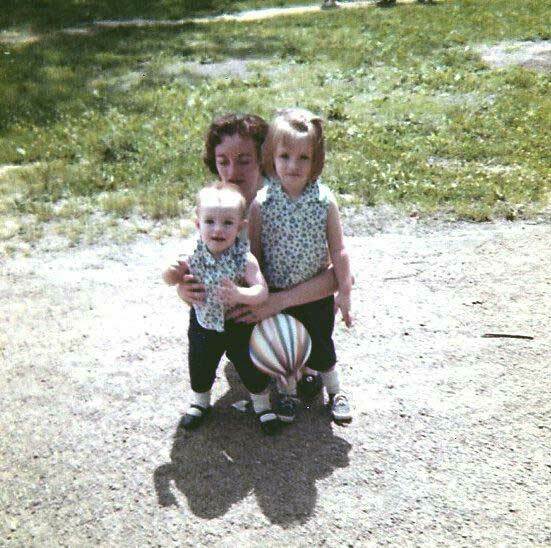 Mom and my sister, Connie, left and me, right. 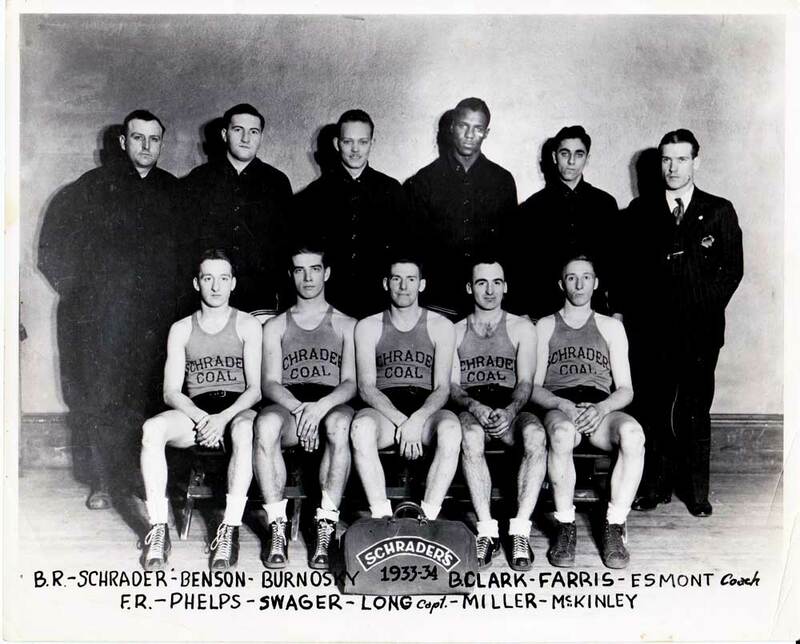 Lloyd Schrader, back row, far left. 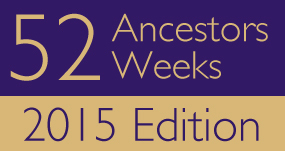 52 Ancestors: #13 ~ Lloyd Albert SCHRADER ~ And Now…Something Different. 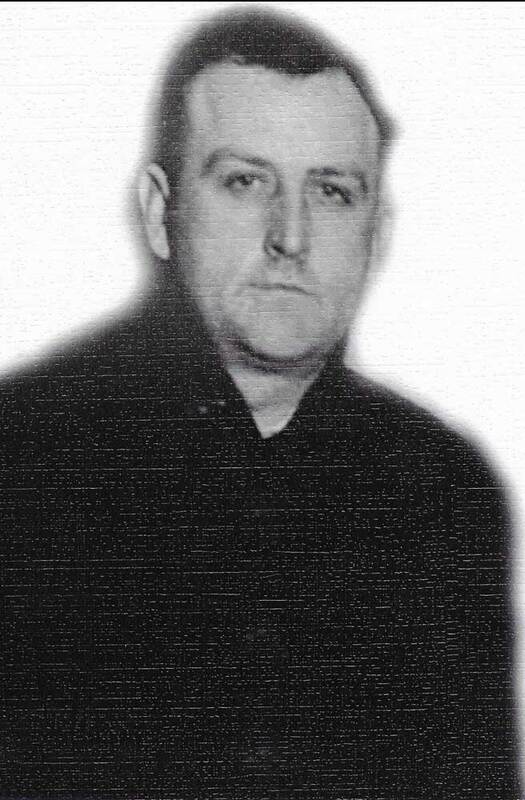 Photograph believed to be that of Lloyd Albert Otto. Photo courtesy of Vicki Schrader Shreve. I have admitted here before that I have not researched my father’s family as often or as in-depth as I have my mother’s. A lot of that has to do with the fact that it was my maternal grandmother who peaked my interest in the family history and who passed me a lot of information, sometimes just written on the back of an envelope. When I started actually working on a family tree, though, it bothered me a lot that I knew nothing at all about my paternal grandfather’s father. Nothing. Zilch. Nada. The only thing that I had to go on was the name of the father listed on my grandfather’s death certificate, “Wm. A.”. 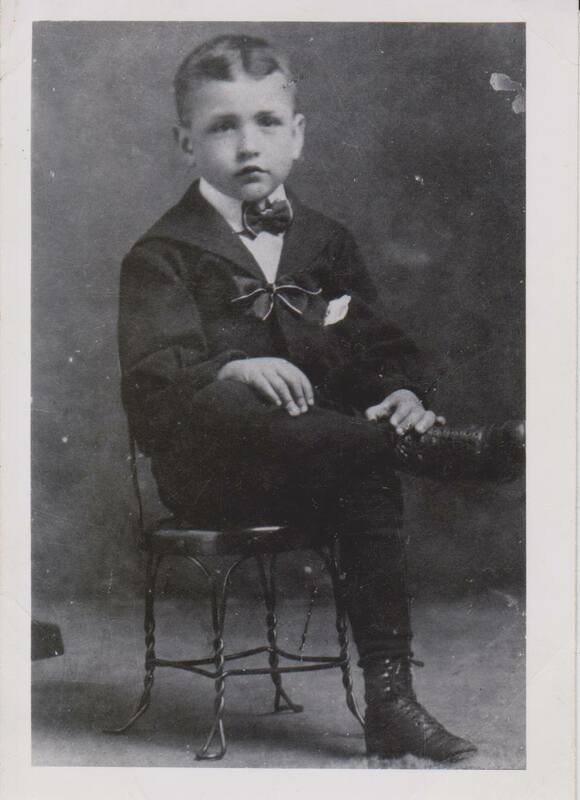 My dad’s father was born, Lloyd Otto, on Wednesday, 19 April 1899, in Plain Township, Stark County, Ohio to Lydia Pearl May, the unmarried daughter of Joseph C. May and Margaret F. Dobson. The father is listed as Albert Otto. In the 1900 census of Plain Township, we find Lydia listed in the household of one Louisa Stoner as a servant, along with her year-old son, A. Lloyd Otto. Although technically, Lloyd is listed as the son of the head of household, we know that census takers can and did note things incorrectly and that the 61 year old, widowed, Louisa Stoner could not be the mother. Lydia Pearl May married William S. Garner on 16 February 1905. In the 1910 census, we find 11-year- old Lloyd Otto listed as a servant in Lydia and William’s household and it is noted that he is a “helper” on the farm. In 1918, Lloyd registers for the WWI draft using the name Lloyd Albert Schrader. Hmmmmmmm. This is the first instance where I have a document with the surname Schrader. Lloyd is described as being tall, of medium build, with brown eyes, and dark hair. He lists his mother, Lydia Garner, as his nearest relative. He states his occupation as a thrasher working on the farm of a Fred Brown where he is apparently also boarding, according to addresses given. In the 1920 census, we find Lloyd Schrader living in North Industry as a boarder in the house of Albert F. Deible. His occupation is listed as a truck driver, hauling coal. Mr. Deible is a coal dealer, so it would seem that Lloyd is probably working for him also. 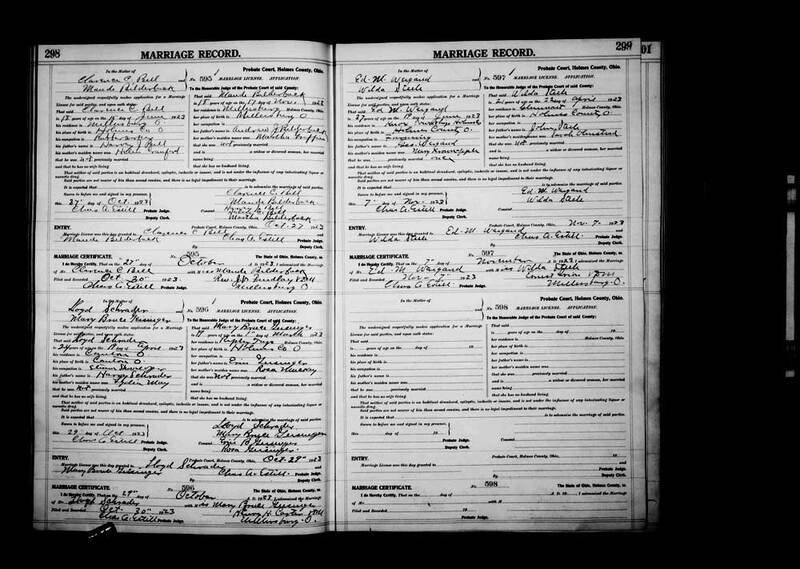 On 29 October 1923, Lloyd married 19-year-old Mary Bruce Geisinger, daughter of Erin Bruce Geisinger and Rosa Manley, in Holmes County, Ohio. Lloyd’s occupation is a steam shovel operator and he lists his parents as Harry Schrader and Lydia May. We find Lloyd and Mary Schrader in the Louisville City Directory living at 123 S. Chapel St. in 1927 and Lloyd is working at Oyler Brothers. Lloyd and Mary have two sons, but on 06 June 1928, Lloyd is granted a divorce from Mary. Around this point in time is where my grandmother Erma R. Minnie Pittman, daughter of Jeremiah Mason Pittman and Sarah “Lena” Pool, comes into the picture. We find Lloyd and Erma in the 1930 census in North Industry, Stark County with Lloyd’s two sons from his previous marriage and a new son. Lloyd’s occupation is still as a shovel operator and says that he is a “road-builder”. In December of 1936, Lloyd applies for his Social Security Number. Notice that the year of his birth is incorrect on this document (below). 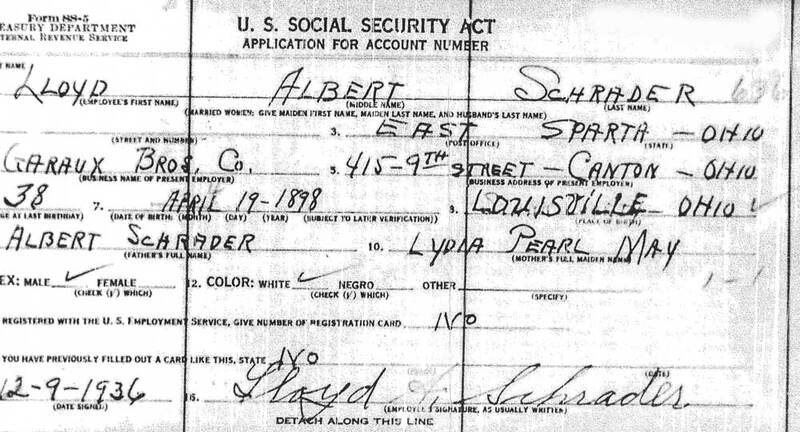 He is now working for Garaux Brothers and has listed his parents as being Albert Schrader and Lydia Pearl May. The 1940 census finds Lloyd and Erma and their growing family living in Plain Township, Stark County, Ohio. It is stated that they were living in Canton, Ohio in 1935, but this might be the North Industry home as the area is also known as Canton South. Lloyd is working for Garaux Brothers as a shovel operator. On 03 January 1943, Lloyd died of a “heart malady”. He left seven sons and three daughters besides his widow, Erma. He is buried at Valley Chapel Cemetery on Trump Road in Stark County, Ohio in Section 3 South End, Row 7. There are a lot of unanswered questions for this line of my ancestry. Besides Lloyd, my grandmother, Erma, the two oldest sons and the youngest son, have all passed away. I have two documents that I have not been able to find that would prove my descent from Erma and Lloyd and those are the marriage document of Erma and Lloyd and the birth document for Erma. Neither one seems to be in existence where they should be located. I have no idea and no viable theories about the name change from Otto to Schrader. After a long search, I have located an Albert Otto associated with the May family in Pennsylvania, and believe him to be the father of Lloyd; however, this is just speculation at this point. It took looking at many, many census records and looking at collateral lines to come up with this information. Because of obvious reasons, foremost being that this is only a theory, I have not laid out my research here that led me to this conclusion. I have to remind myself that patience is a virtue. 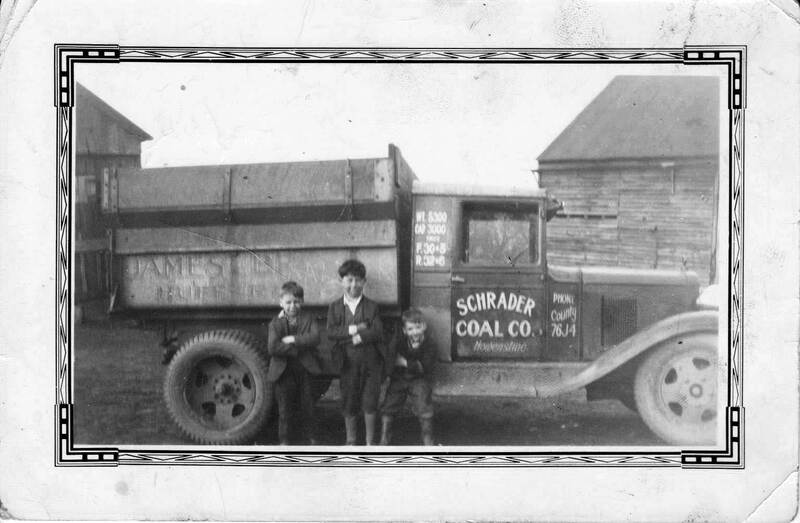 Schrader Coal truck with two of Lloyd’s sons flanking his nephew. 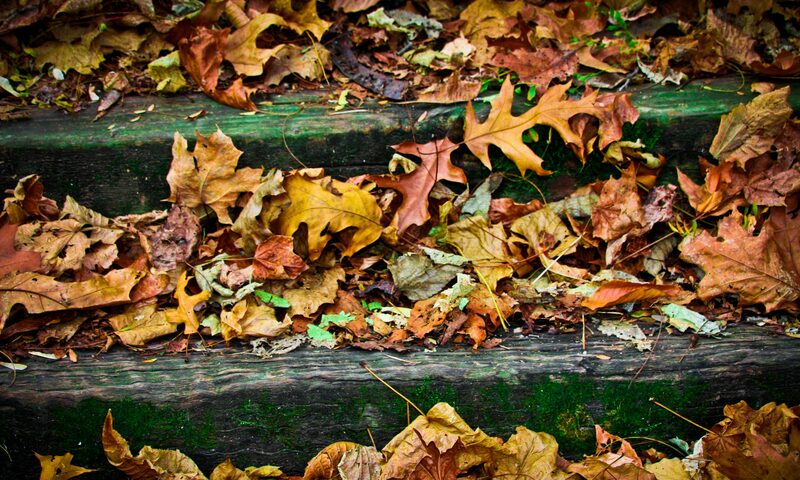 Photo courtesy of Vicki Schrader Shreve. The optional theme for this week was “Different”. Database online. Year: 1900; Census Place: Plain, Stark, Ohio; Roll: T623_1323; Page: 12A; Enumeration District: 143. Database online. 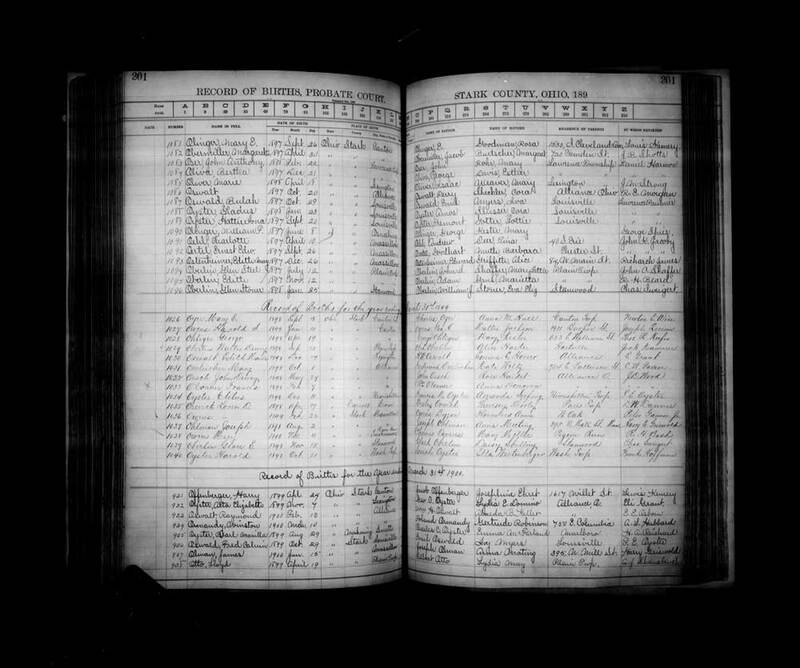 Year: 1910; Census Place: Osnaburg, Stark, Ohio; Roll: T624_1232; Page: 10A; Enumeration District: 0215; Image: 646; FHL microfilm: 1375245. Database online. Year: 1920; Census Place: Canton, Stark, Ohio; Roll: T625_1433; Page: 3B; Enumeration District: 21; Image: . Database online. Year: 1930; Census Place: Canton, Stark, Ohio; Roll: 1871; Page: 2B; Enumeration District: 60; Image: 539.0. Database online. Year: 1940; Census Place: Plain, Stark, Ohio; Roll: T627_3151; Page: 13A; Enumeration District: 76-91. Social Security Administration. Copy of original document. Database online. 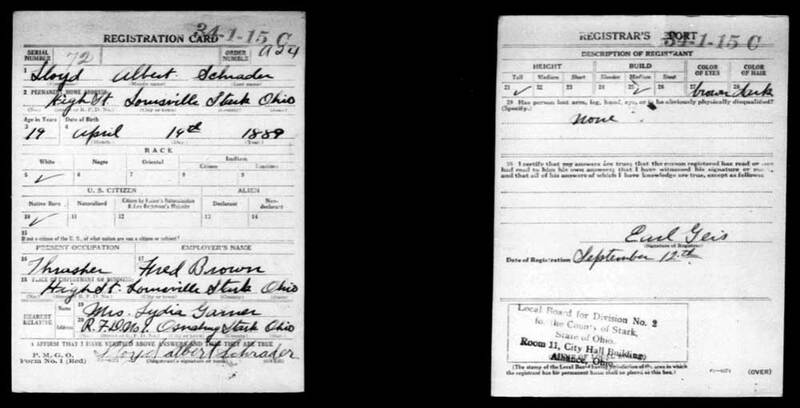 Registration Location: Stark County, Ohio; Roll: 1851190; Draft Board: 2. 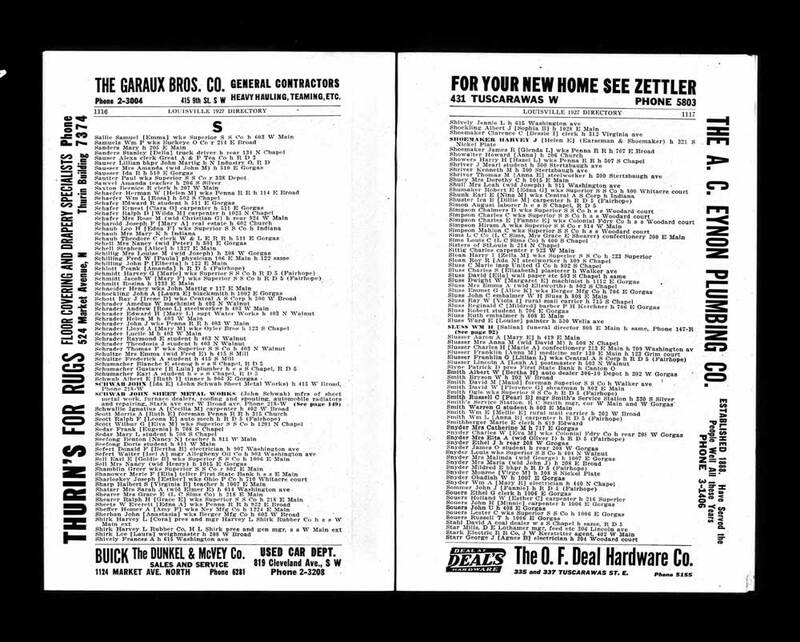 U.S. City Directories, 1821-1989. Louisville 1927 Directory. Database Online. 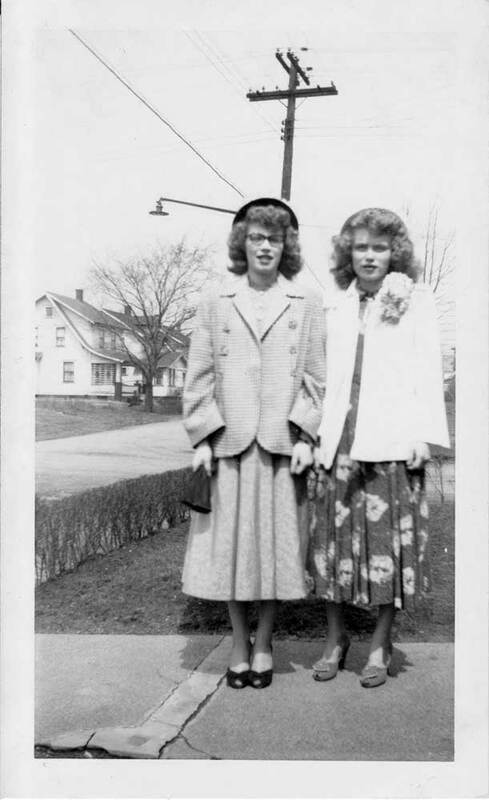 Aunt Dolores, left, and sister.